This is the first line from a speech by Paul Harvey that has always held a special place in my family’s heart. For as long as I can remember I was taught that John Deere green is the best color, a little dirt never hurt, and to work hard in every activity that I am a part of. I feel that many of these things came from the fact that my grandpa was a fourth-generation farmer, and my uncle and dad are fifth generation farmers. Agriculture has been a major aspect in my life since day one and I will continue to do my best to support an industry that I believe in so much. Starting in third grade, I became a part of a local 4-H group and freshman year of high school, I joined my local FFA chapter. 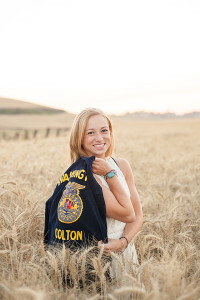 Currently I am an alumni of the National FFA organization and am thankful for my four years of active participation in the program. I learned an incredible amount about the ag industry over my four years and had the opportunity to compete in many Career Development Events such as Agricultural Issues Forum Team and Prepared Public Speaking and serve as my chapter’s President. Now you may be wondering why I am talking about agriculture and it’s because March 20th is National Ag Day!!! So, I thought I would share a few fun facts about agriculture to raise awareness about an industry that I am so fond of. There are around 2.2 million farms in the United States. About 80% of the worlds almonds come from the state of California. Pork is the most widely eaten meat in the world. The average dairy cow produces seven gallons of milk a day, 2,100 pounds of milk a month, and 46,000 glasses of milk a year. Approximately 97% of U.S. farms are operated by families, family partnerships, or family corporations. Farmers today produce 262% more food with 2% fewer inputs (such as seeds, labor, fertilizers) than they did in 1950. The world population will jump from 7 billion to 9 billion by 2050. Farmers will need to double food production by then to keep pace. One U.S. farm feeds 165 people annually in the U.S. and abroad. Cattle and calves, corn, and dairy products are the top 3 U.S. farm products. Farmers and ranchers receive only 16 cents out of every dollar spent on food at home and away from home. Growing up in a small agricultural community to many from the outside seems like a burden, but for me and many others it is a way of life and is home. We continuously strive to inform others about the industry and what they can do to get involved. Not only is it important that others understand the importance of agriculture, but that they too can have an influence no matter where they live. National Ag Day is meant to bring awareness to the industry and teach others about something that affects their everyday lives whether they know it or not. The FFA motto is “Learning to do, doing to learn, earning to live, living to serve.” This motto shows what many students across the United States follow to show others the importance of agriculture.